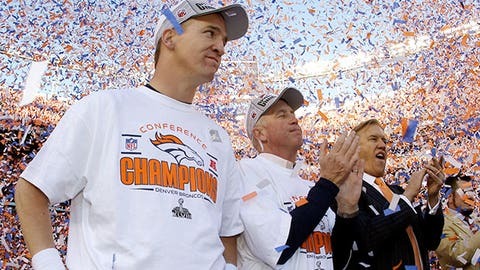 Peyton Manning and the Broncos defeated the Patriots 26-16 to advance to the Super Bowl. With the hype and buildup before games like this, we seldom have a delivery of what we all desire. The idea that two teams – in this case, both division rivals that are built in largely similar fashions – would slug it out at the expense of each other’s well-being for 3 hours of nationally televised entertainment is often too much to expect on the big stages. The hype outweighs the reality. However, quite clearly to me, on this occasion, both Seattle and San Francisco left it completely on the field in a classic game that won’t be forgotten by its witnesses anytime soon. I know that the human body could not sustain the punishment of my proposal, but if they wanted to switch these to a Best of 7 series between the two teams, I would be all for it. But, this game was not just about turnovers. It was about physical play that made viewers cringe. It was about flying around the ball and almost nobody protecting themselves to make a play. It was about brutal hits and guys being helped off the field. I don’t know that it made anyone more comfortable with the long-term effects of seeing these guys treat their bodies with such disregard, but the spectacle of it all is impossible to resist if you love this game. The pack mentality of both teams playing with a unified spirit of how they believe the game should be played could have had no other outcome. When these two teams, who most Sundays are the clear bullies to their opponents, square off against each other, you knew that there would be a square-off that could not be missed. As a viewer who was unaffiliated with the teams involved, it makes you consider a number of things with a far more league-wide application. Such as, do we think that the local team can ever assemble enough bullies to stand up to this sort of treatment, or like the Saints last week or the Packers the week before, do you attempt to survive it for 60 minutes by trying to adapt your style to theirs? It would be more sustainable to simply understand that although Hal Mumme, Art Briles, Mike Leach, and Chip Kelly have all aided the evolution of football to something that isn’t just a trench fight, it still is the best plan to build a roster that cannot be pushed around from top to bottom and from little to big. Those two rosters, as I wrote about last week, have built their entire organizations around the plan of never being the weaker side in a fight. Now, the skills on each player vary as they always do, but they are looking for a certain type of player and that is the type of guy who is not going to back down when challenged. Yes, they still want speed and skills, but they are clearly placing a premium on disposition and guys who aren’t allergic to the occasional personal foul or barking match. I know this leads to many shades of gray and perhaps a discussion that includes contradictions throughout, but if you don’t think those teams are playing a modified style from the NFC powers of 2009-2010 when New Orleans and Green Bay were winning their Super Bowls which included limited helpings of physical intimidation, then I believe we aren’t watching the same thing. Wilson, like I said, is a more balanced QB and seems to be far better at a number of important skills that teams look for. If he was 4 inches taller, he would have almost no doubters. In fact, he is clearly a player being asked to win without premium WRs or a premium TE at his disposal. If I am Seattle, I feel good about Wilson and increasing his workload so that down the road when I have some proper weapons for him it won’t seem out of character to try to get 20-24 completions out of him once in a while as opposed to the 15 that they presently get. But, in that 4th Quarter, he showed his warts again and they weren’t pretty. At 10:17 to go, when rolling left on a 3rd and 6, he tried to throw against his body and did not feel the rush and put the ball in harm’s way for Cliff Avril to strip from the backside. Michael Bennett recovered and ran the ball back to the San Francisco 6. As for the other lasting memories from the game, Navorro Bowman’s injury, the odd rule application of that very play, Marshawn Lynch’s touchdown run, and of course Sherman with Erin Andrews will all be high on the list.